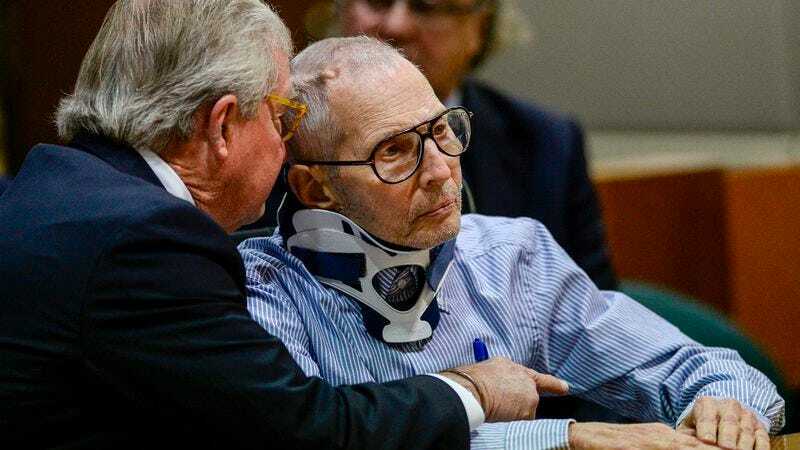 Suggesting that he never actually sat down and watched HBO’s The Jinx—the documentary series that presented pretty compelling evidence that he is, in fact, a murderer—real estate heir Robert Durst pleaded not guilty today in his trial for the murder of Susan Berman. That comes from The Los Angeles Times (via The Daily Beast), which explains for anyone else who missed The Jinx that Durst has been accused of killing Berman because she was about to be interviewed by investigators who were looking into the disappearance of Durst’s wife, who he also allegedly killed. The L.A. Times story says Durst—who is 73—appeared in court wearing a neck brace, with his attorney explaining to reporters that he is “recovering from a spinal fusion surgery.” The story also notes that, aside from entering his plea, Durst was quiet for most of the hearing and only occasionally turned around to talk with his legal counsel or to look at the many reporters in attendance. As for the prosecution, they will not be seeking the death penalty, though they declined to say anything else on the subject. Durst’s next court date won’t happen until next year.